We are so fortunate that our kind and compassionate guru, Gyumed Khensur Rinpoche Lobsang Jampa, is returning to Vajrapani Institute to lead another retreat on Tantra in 2019. He will start on a multi-year commentary on Lama Tsongkhapa’s great treatise on the stages of tantra, the Ngakrim Chenmo. It’s rare to get an introduction to Tantra in a step-wise fashion from the lower classes of Tantra all the way to Highest Yoga Tantra. Rinpoche will give the Four-Armed Avalokitesvara Initiation and then give commentary on Action Tantra using a sadhana of Avalokitesvara in combination with the Action Tantra section of the Ngakrim Chenmo. 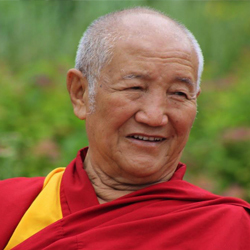 Rinpoche will teach Oct 18-25 and the rest of the retreat (led by Elaine Jackson) will concentrate on the Chenrezig practice with Mani mantra recitations and meditations on love, compassion, and bodhichitta in connection with reciting the Mani mantra (these are Rinpoche’s instructions). Rinpoche also requested that students come with a goal of a certain number of mantra recitations that they want to collect during the retreat (“a person could set a goal of 100,000 or 600,000 or 1,000,000 mantras!”). Rinpoche stressed that it is important to put the Tantra instructions that he gives into practice. Because of this, please plan to stay for the entire retreat—even after Rinpoche leaves—so that we can follow our guru’s instructions. There are no prerequisites for this retreat. The base fees listed above reflect the true cost of hosting visitors and are higher as a result. If you are financially able, we encourage you to please pay these fees. That said, we also offer subsidized fees designed to allow as many people as possible to attend. These fees are supported by generous contributions to Vajrapani Institute and are about 12% off the full cost. You can access those fees by using a discount code that will be provided to you at registration checkout. The accommodations are the same for both options. Gyumed Khensur Rinpoche Lobsang Jampa is one of the last generation of Tibetan Buddhist scholars to begin their educational careers in Tibet prior to the Chinese invasion. He has played an instrumental role in the reestablishment and preservation of Tibetan Buddhist traditions in exile, and in the spread of Tibetan Buddhism to the Western world. 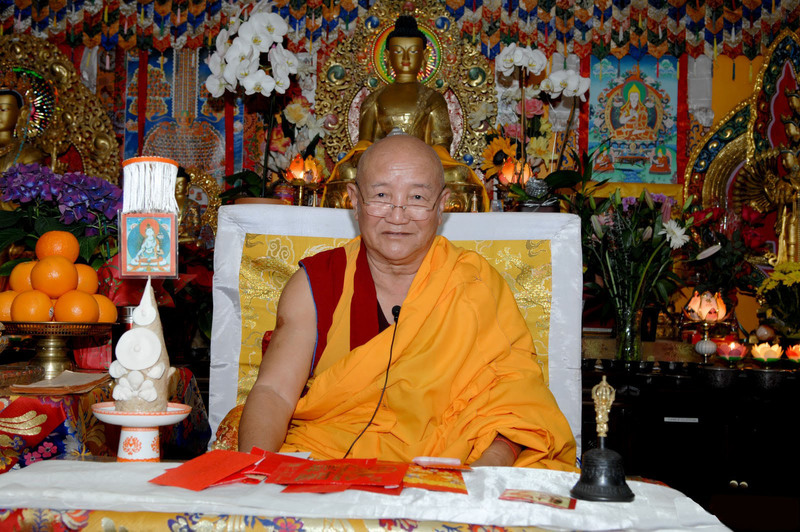 Highly regarded for his scholarship and depth of religious practice, Rinpoche teaches frequently in New York, Washington D.C., and at Do Ngak Kunphen Ling (DNKL), a Tibetan Buddhist center in Connecticut, where he hosted a visit from H.H. the Dalai Lama in 2012. He is abbot emeritus of Gyumed Tantric College, head of Mey College’s Thewo regional house at Sera Monastery—one of the largest Tibetan monasteries in exile—and Spiritual Director of DNKL where he resides.